Astor Alive Festival on Astor Plaza. The type of event we’d like more of. The Street Activities Permitting Office (SAPO) has recently released a second version of New Event Rules that seem to better address the issues of security and overabundance, maybe. Here they are in their entirety and here’s the CECM-SAPO webpage. 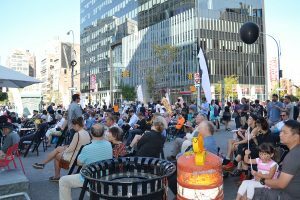 For NoHo-Bowery these new event rules impact events on the new Astor Place and Cooper Square Plazas and “special event” permits like the annual Il Buco Pig Roast. Not all aspects of the first version are covered e.g. the addition of PRIVATE events to the roster of Plaza event possibilities...news conferences, receptions, fund-raisers that come with tents and limos [read http://www.nohomanhattan.org/wordpress/2016/09/03/plaza-event-rules/ ] but what is made even more clear is that the Mayor’s Office intends to be the decider on all things event related and income producing, regardless of neighborhood interests. In at least one area the new rules seem to have regressed: the time for local – Community Board – review. The time to respond to most applications is less, now 30 days, with the exception of large Plaza events which will have 45 days. The time frame for “Special Events” (commercial promotion events) has been reduced to 10 days. Again, the responsibility lies with the Community Board to be proactive with insufficient time to respond – outreach to constituents, scheduling of Committee hearing, approval of the Full Board, resolution response to SAPO. Further, should the Community Board impose conditions or denial, it must be issued five days before the event deadline for an applicant to respond. At no time does the Community Board – or the Community – have an opportunity to evaluate the applicant’s response. The decision is left to CECM/SAPO also tasked with producing City income. change the fees imposed for street fairs to a method that reflects the City’s costs related to administration and traffic control for these events. The Director shall issue no more than ten (10) permits for Street festivals per community board in any calendar year. No more than one Street festival permit per calendar day will be issued in any community board. No more than two hundred (200) Street festival permits will be issued within the City of New York in any calendar year, with no more than one hundred (100) 12 of those permits to be held in the borough of Manhattan in any calendar year. Website. You can submit comments to SAPO through the NYC rules Web site at www.nyc.gov/nycrules. You can read some coverage from POLITICO, here.